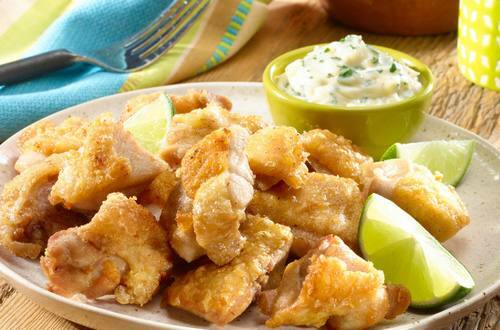 1 Dissolve 2 tablespoons Knorr® Chicken flavor Bouillon in water in medium bowl; add chicken and stir. Cover and marinate in refrigerator 2 hours. Remove chicken from marinade, discarding marinade. 2 Combine flour, 2 tablespoons of the remaining Knorr® Chicken flavor Bouillon and oregano in medium bowl. 3 Heat oil in deep skillet to 360°. 4 Dip chicken in flour mixture, shaking off excess. 5 Fry chicken in batches, turning occasionally, until golden brown and thoroughly cooked, about 8 minutes. Drain on paper towels; keep warm. Garnish, if desired with lime wedges. 6 To make sauce, process Hellmann's® or Best Foods® Real Mayonnaise, lime juice, garlic, cilantro and remaining 1 teaspoon Bouillon in food processor; transfer to small bowl and serve with chicken.